Summer is officially on the way. You know what that means? Weekend visits to my local farmers market! Some people won’t get it, but trust me when I say this – I’m crazy about fresh produce. 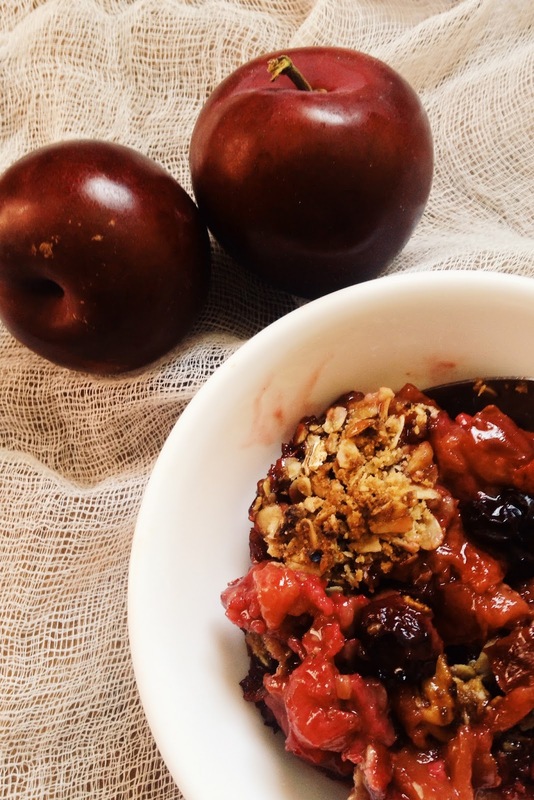 This weekend, the markets were full of berries and plums. So fresh you could smell them from a mile away. Well, not exactly a mile away, I’m exaggerating but you get the idea. I love fruit desserts. Especially crumbles or crisps. What I love about them is they’re so versatile. You could make them with any seasonal fruit. 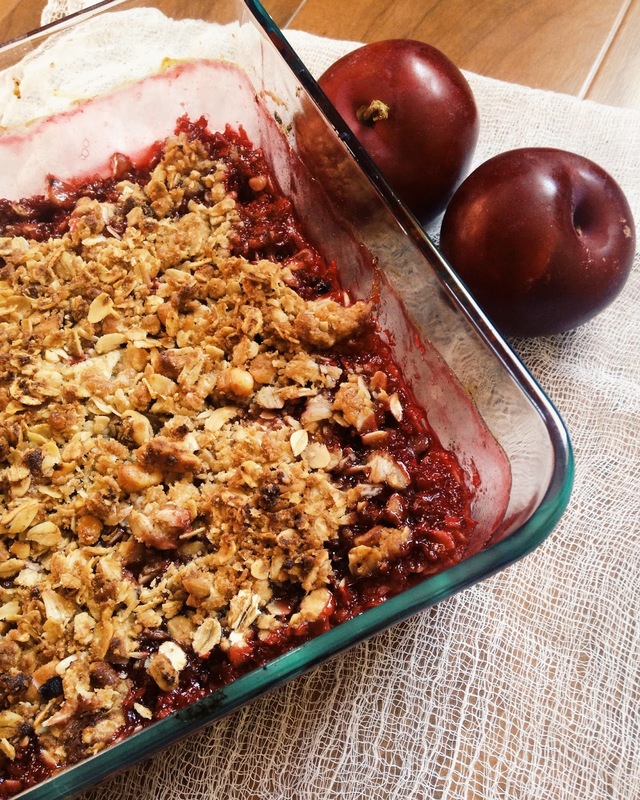 I make apple and pear crumbles in the fall and in spring/summer, plums, berries or even cherry crumbles. They use rolled oats and no eggs! When fruits are roasted you get this amazing concentrated fruity flavor and you don’t need a lot of sugar to sweeten them. Toss all the filling ingredients and bake for 10 minutes in a 425 deg F oven for 10 minutes. Mix all the topping ingredients by hand. Smush the butter cubes until you get a crumbly mixture and you can see little specks of butter throughout. Sprinkle the topping evenly over the fruit and bake for about 25 minutes or till the topping is brown and the fruit is bubbling. Serve warm with some vanilla ice cream. Hi Hema! Honestly writing… I heart your write-ups. Love the photos and recipes. So this is an open invite to you… if any day you feel that you must stop blogging, then please come & join me at crimsonapril.com, would love to have your recipe posts there and I will keep your presence as an asset for my blogging-world, as I respect your effort on this 🙂 May sound like I am bribing or influencing you… but I am very true at my heart to mention this 🙂 *hugs* And yup m also crazy about fresh produce at farmer's market… keep in touch! Wow, no eggs is so for me and my wife. We have to go to a farm soon for picking up something…i leave it up to my wife normally to decide. Thank you, Alok, for all your encouraging words!